New research has shown Australia, the US and Canada are the most popular long-haul destinations for travellers in Hong Kong this Chinese New Year. 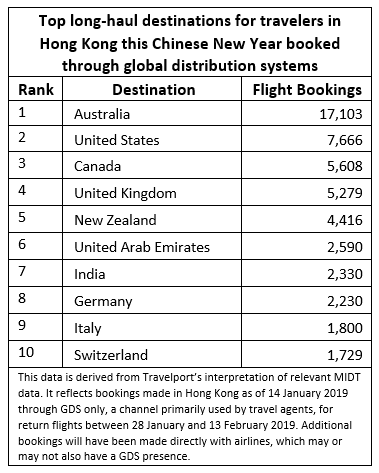 According to an analysis conducted by Travelport, by mid-January, a total of 17,103 advanced bookings had been made in Hong Kong for return flights to Australia between 28 January and 13 February 2019. Flight bookings to US (7,666) and Canada (5,608) were second and third place respectively. The top long-haul destinations which had seen the greatest year-on-year percentage increase in flight bookings around the Chinese New Year period were Germany, up 72 per cent to 2,230 bookings (ranking from 12 to 8), New Zealand, up 29 per cent to 4,416 bookings (ranking from 6 to 5), and the United Arab Emirates, up 20 per cent to 2,590 bookings (ranking from 7 to 6). “This year, long-distance travel has been particularly popular among Hong Kong travellers, because the almost full-week public holiday makes it easy for travellers to plan a long vacation,” Ming Foong, Travelport’s regional managing director for Asia said. “The appeal of Australia to Hong Kong travellers could be attributed to its warm weather, attractive resorts and abundant flight options. Travel Weekly recommends reading this story while listening to “Happy” by Pharrell Williams or “Walking on Sunshine” by Katrina & The Waves. Unless, of course, you’re terrible at multitasking. With news that trips to Brazil could save Aussies up to $50, Travel Weekly’s caffeine connoisseurs have elected to drop Blend 43 for the exotic Moccona Barista Reserve.